Should I Trade Adrian Peterson? R u still mad at me? Trade Adrian Peterson, Jimmy Graham and Brandon Lloyd for Ray Rice, DeSean Jackson and Vernon Davis? Thanks for writing in. This certainly is a tricky trade scenario but if its me I am taking the side that gets Adrian Peterson, Jimmy Graham and Brandon Lloyd (not sure which side is yours) Lets compare the players briefly to understand why; while Vernon Davis has been one of fantasy football’s top tight ends the past couple season, Jimmy Graham helped raise the bar last season placing a new bar for what fantasy’s top tight end should achieve. I strongly prefer Jimmy Graham in this situation. Brandon Lloyd was amongst the top receivers in targets last season in St. Louis with Josh McDaniels as his offensive coordinator. Now over in New England Lloyd has Josh McDaniels as his offensive coordinator yet again only this time he will have one of the best quarterbacks in the game throwing him the ball - the potential is through the roof! While that New England receiving corps is a little crowded, I am confident there will be enough to go around. Desean Jackson is now second fiddle to Jeremy Maclin and often does not show up mentally for games. He is not a receiver I like owning but I do view him as a number 3 fantasy wide receiver with high upside. And then we have the running backs. If you buy into the whole “Adrian Peterson is superhuman” school of thought then this is a bit of a down grade. That said, the guy tore his ACL and MCL at the end of 2011 making him a huge injury risk coming into 2012. The opportunity to get Ray Rice and solidify your running back position is the only reason to consider this trade. I view this as a down grade at tight end, a down grade at wide receiver and a question mark at running back. 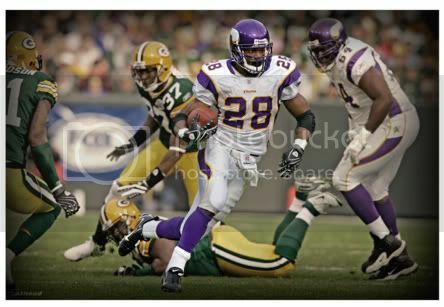 If Adrian Peterson comes back full strength he is going to instantly be top 3 overall. Even if he is 80% is still consider him top 15-20 and certainly serviceable. I think the side giving up Adrian Peterson, Jimmy Graham and Brandon Lloyd is giving up to much and should pass. If you are on the other side of the equation, I would jump all over this trade! Even if Peterson turns out to be less than full speed you can parlay Jimmy Graham into a running back and mid-tier receiver via trade after Graham has an inevitable monster game. Hope this helps! Feel free to write in any time for unlimited free fantasy football advice!